If you are joining me here today from my contributor's post over at Worshipful Living...welcome! I'm so glad you are here! 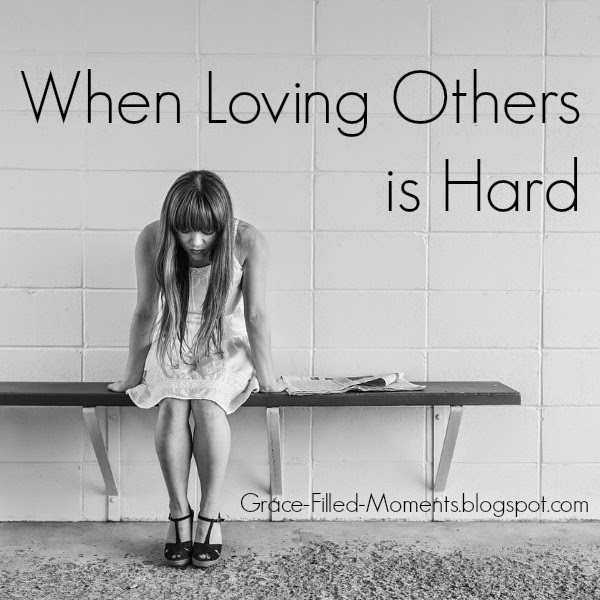 For those of you who are faithful readers here at Grace-Filled-Moments, it would be helpful for you to head over to Worshipful Living to read my post, When Love Isn't Easy, before you jump into this post. 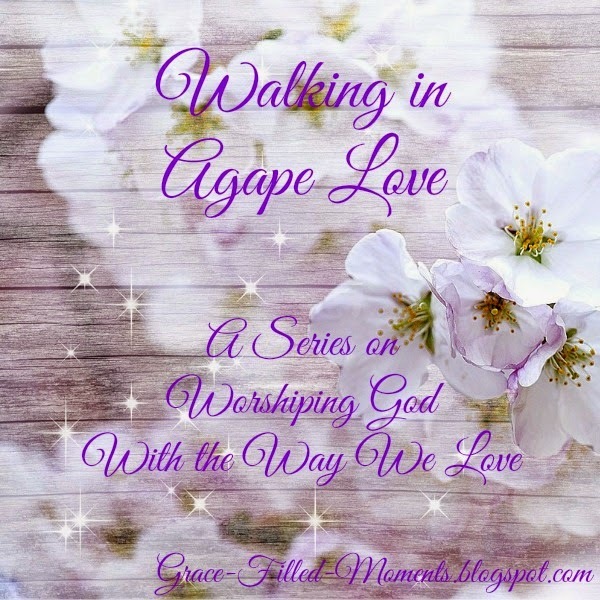 Just be sure to open up a new tab in your window, so you can come back here to read this first post in my Walking in Agape Love Series. For the next 4 Sundays, I will be discussing the sixteen characteristics of agape love that the apostle Paul speaks of in 1 Corinthians 13:4-8. We'll look at 4 characteristics each Sunday. "This is not a fruit-basket life where we can pick and choose which part of Christlikeness we want to put on. No, this is more like an orange, where each virtue is a different slice of the orange. You must have all the slices together and in their places to have a whole, complete orange. Having some of all of these characteristics in your life is outward proof of the indwelling of God’s Spirit, which takes place at the time of salvation and adoption." Don't you just LOVE her analogy using the orange?! When I first read this in Katie's book (you'll find my review here), it was a big "aha" moment for me. Patience. When most of us hear this word our first thought is that some type of trouble comes with it. There is even the saying, "Don't pray for patience because then God will give you something to test it" ...or something like that. Patience is something that grows with practice. If we desire to have the outward proof of the fruit of patience in our lives, then we must be willing to use the trials of our lives to grow patience. There is no better way to grow patience in our lives than to stay committed when loving others is hard. When the going gets tough, the world says the tough get going. That's not God's way my friend. Maybe God wants to grow patience in you through that friendship that is tough. Maybe God wants to grow patience in you through your marriage that has found itself in the winter season. We see from the verses above in James that patience is a Fruit of the Spirit in our lives that is well worth cultivating because when we let patience have its perfect work - we will lack nothing in our relationships. Kindness. The Merriam-Webster dictionary defines kindness as the "act of being kind"; and kind is defined as "having or showing a gentle nature and a desire to help others: wanting and liking to do good things and to bring happiness to others". So we can see here in these definitions that there should be action taking place in our lives as evidence of this Fruit of the Spirit. Just look at the life of Jesus if you need an example to emulate. He was always doing kind things: feeding the hungry, healing the sick, teaching the multitudes, and the list goes on and on. In what ways are we showing kindness in our relationships? When our husband is sick - do we show kindness in how we take care of him or are we grumbling under our breath every time he asks for a drink of water or for a tissue? When a friend is calling you just as you are about to sit down for a moment to yourself because she needs a listening ear - are you going to answer the phone and be that listening ear extending kindness in her time of need? What about the friend who has hurt you deeply - are you going to be kind enough to forgive and try to restore the relationship? We have a choice in whether or not we choose to show kindness when loving others is hard. When we let the fruit of kindness have its way in our lives the actions we take will tell those God has placed in our lives that we love them and value them. What is something you can do today that will show agape love to a relationship that is struggling in your life right now? Finally, agape love does not envy or boast meaning that we do not covet what other people have whether it be their possessions, success, abilities, etc. ; nor do we boast of our possessions, our success, our abilities, etc. Coveting and pride are both sinful actions that we should avoid as we seek to walk in agape love. Well, we have a lot to think about with these 4 characteristics of agape love, don't we?! My prayer is that you and I will allow the Holy Spirit to direct us when loving others is hard. May His power that is alive and active in us cultivate patience and kindness in our lives so that others will see how valuable they are to us as we choose to walk in agape love. I hope you'll join me again next Sunday as we look at the next 4 characteristics of agape love. Until then, keep walking in His grace! I love discussions about agape love, this is really good. Thank you for taking the time to pray, research and share with us. Thanks, Tammy! This was the first of four posts I'm doing in this series. Check back here each Sunday this month for the posts that are coming. I'm glad you are here!